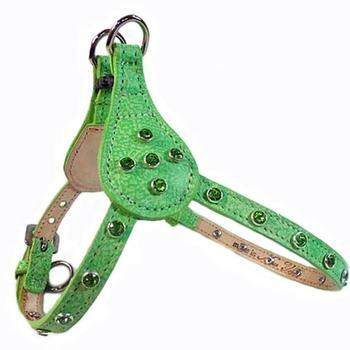 The Cluster custom step in harness is made of fine leather and is offered in a large array of colors and choices.Harness have hand-painted edges and straps, are adjustable to provide a secure and comfortable fit, and and the Swavorski crystals are secured with a nickel rivet in the center.. Once your straps are adjusted to your pet's size you will only need to use with the side release buckle that opens and closes on their back near the neck. Each harness has a nickel O-ring on the strap loop to attach ID tags and nickel buckles. 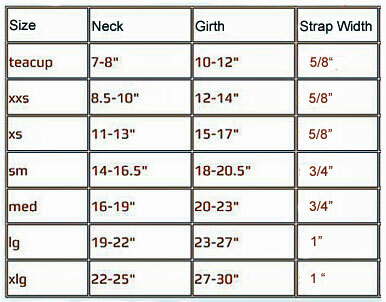 Please measure the actual size of your dog's neck and girth (chest area behind legs). Our harnesses are sized when closed to the center hole.For a truly personalized designer leather dog harness, you pick the color of the leather for the harness and the color of the stones.